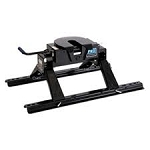 Reese 5th wheel hitch products are based on decades of experience in designing and manufacturing hitches that work. They spend a lot of money designing and testing to help insure that you have the best hitch products available. Their products have stood the test of time...products that are easy to install and easy to use. Please Note that a rails/installation kit (product # 94-4067 ) must also be ordered for a complete system. The rail kit is not included as part of the hitch and is sold separately. A 5th wheel hitch from Reese come with a five year manufacturer's limited warranty. Please consult the manufacturer's warranty information for warranty details. Reese's fifth wheel hitches are designed for quick installation. They provide reliable performance yet are quick to remove which allows full access to the truck bed when not towing your camper. Allows for adjustment heights from 15" to 18"
The Pin weight capacity is 4,000 lbs. The release comes with cushioned handle grips...this makes it easier on your hands. The powder-coat black paint finish provides long lasting beauty. Quick to remove to allow full use of truck bed when not towing. Square tube Kwik-Slide™ available for shortbed or extended cab trucks to provide turning clearance and prevent damage to your truck and trailer in tight places. 10" travel, adjusts with trailer attached. Will not fit beds shorter than 6'.